Power, Pleasure and Profit by David Wootton is read by Charles Constant for Tantor Audio. 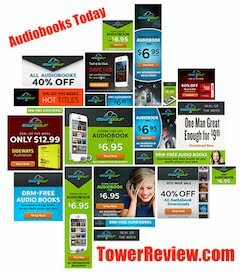 If you are a professional book reviewer and would like a free download code, leave a comment. I have a few left. No club to join, no strings. If not, go HERE. 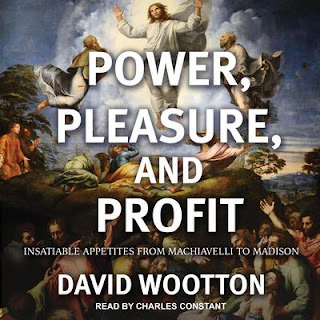 The subtitle is “Insatiable Appetites from Machiavelli to Madison.” Wootten is a professor of history at the University of York (UK.) Previous books include The Invention of Science, and Bad Medicine: Doctors Doing Harm Since Hippocrates. This audiobook is a densely researched examination of how our culture became what it is: driven by “success” at all cost. 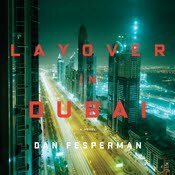 While it can’t be described as “a light read” (or rather “listen”) it is quite eye and ear opening. Not the typical fare, but ultimately fair in debunking the socio-economic background to today’s focus on “instrumental reasoning.” (Like the instrumentalism which David Deutsch debunked in his “The Beginning of Infinity,” as a computer scientist and historian.) Was Adam Smith correct in “The Wealth of Nations?” In the telling chapter eight, it is revealed that “starvation in the midst of plenty” was the rule, and Smith overlooked caring for the poor in favor of the “utility” of selfishness. People died in the streets, not from lack of food, but from lack of compassion. Money often needed to have a reward as investment, whether in this world or the next, and if one did not believe in the afterlife, there was no reason to care. Wootton jumps back and forth in time to make his points, and to connect the dots on how one philosophy had an impact on others in other generations. The incidents range from gluttons throwing crumbs to the starving to the legitimized eating of babies (cooking recipes included) in historical Ireland 1740, during a famine when the rich ate well. While this sounds sensational, and stands out, it is mentioned in passing, without emphasis, as a footnote. There’s a lot here. The goal is in the liner notes: “This new instrumental reasoning cuts through old codes of status and rank, enabling the emergence of movements of liberty and equality. 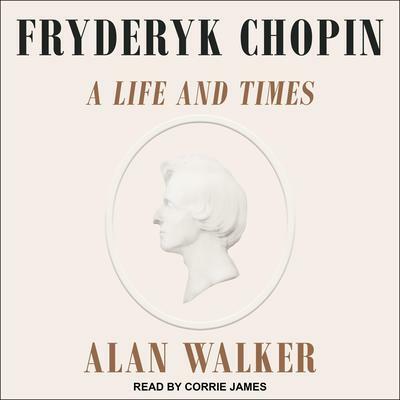 But it also helped to create a world in which virtue, honor, shame, and guilt count for almost nothing, and what matters is success.” Also from Tantor is FRYDERYK CHOPIN: A Life and Times by Alan Walker, read by Corrie James. It’s a biography of the composer, the greatest poet of the piano, who once said, “My goal has always been the heart and soul of man.” Running over 23 hours on audio, it is the definitive history, linked to the times, with scholarly and interesting anecdotes throughout. Listen while in the car or gardening or shoveling snow, and you’ll know more about Chopin with Liszt and George Sand in France, Poland, and the cold studios in Majorca than anyone, as the genius who died young at 39 created music that would last from 1849 to current stages worldwide. There is debunking of Chopin myths, to boot!